Jagtap V*, Samant P**, Valvi D***, Parulekar SV****. Though considered rare, the incidence of cesarean scar ectopic pregnancy (CSEP) is rising with increasing incidence of cesarean sections. Five fold increase is reported in ten years from year 2000. Even with good transvaginal ultrasound (TVS), the pregnancy may be misdiagnosed as cervical ectopic. We report a case of CSEP with failed medical management, later managed with surgical excision. Incidence of CSEP in the literature is around 1:1800 to 1:2000 and increasing due to liberal use of cesarean section. [1,2,3] CSEP poses a therapeutic challenge and risk in women desirous of child bearing. Suction evacuation (S&E) can pose dual threat of hemorrhage and perforation. Options like sonographically guided S&E and laparoscopic management are heavily dependent on the surgeon’s skill. Medical method is limited by embryonic age and Beta Human Chorionic Gonadotropin (b HCG) titers and prolonged time of observation for titer decline. Failure of resolution warrants rescue surgical intervention. 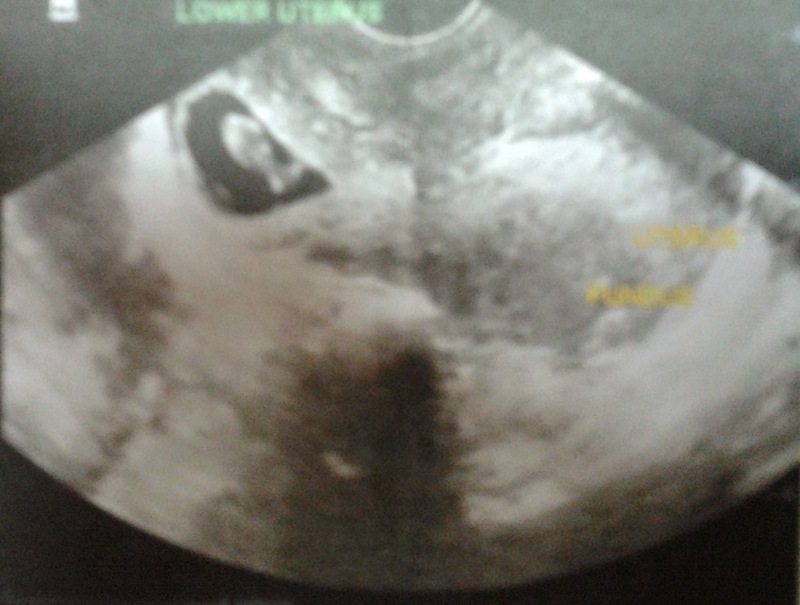 27 years old, gravida 2, para 1 with previous cesarean section and two months’ amenorrhea was referred with painless vaginal bleeding for 2 days and sonography suggesting cervical ectopic pregnancy. She was hemodynamically stable. On speculum examination the external os was closed, there was no bleeding and the cervix was unremarkable. Bimanual examination was deferred so as not to disturb cervical ectopic pregnancy. Her TVS prior to admission showed gestational sac of diameter 2.6 cm with live embryo corresponding to 7.6 weeks in the cervical canal. Internal os was reported open. Biochemical tests for fitness for anesthesia were normal. TVS at our center confirmed a live pregnancy at the cesarean scar site, while the cervix was normal. Her serum b HCG on admission was- 81616 mIU/ml. The patient was counseled about therapeutic options. She opted for multidose methotrexate (MTX) which was given with alternate day folinic acid rescue. Her serial b HCG values were as follows. TVS on day18 showed 9.6 weeks’ viable fetus. Magnetic Resonance Imaging (MRI) was performed. 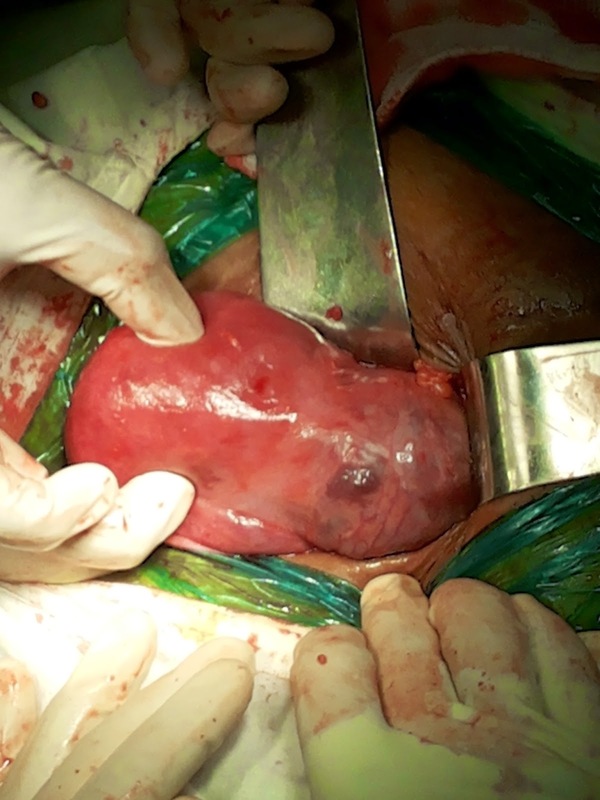 It showed 4.1x 4.7x3.7 cm gestational sac implanted within anterior part of lower segment of uterus, with no myometrial tissue between the sac and the bladder. Uterine fundus was empty. Endometrial thickness was 1.7 cm. Based on MRI and TVS reports, and a rise in serum b HCG level despite treatment, a laparotomy was undertaken. The uterus was bulky. The anterior wall of the isthmus was distended and vascular. 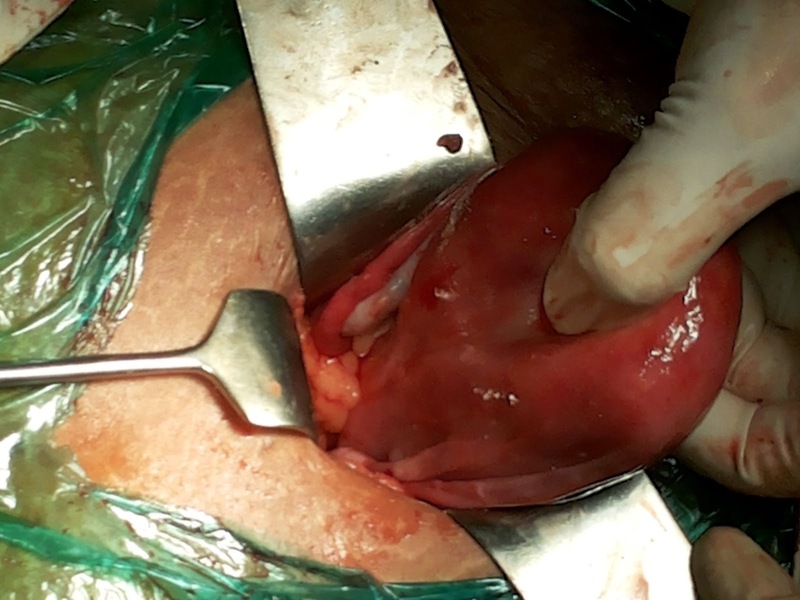 The isthmic area was transversely incised away from the bladder, the sac and placenta were removed, uterus was curetted retrogradely, the scar was excised and edges were sutured. The products were sent for histopathological examination. Distance of external os from the incision was 3.5 cm. The patient made an uneventful recovery. Histopathology of the specimen confirmed the diagnosis of cesarean scar ectopic pregnancy. Figure1. Transvaginal ultrasonogram suggestive of cervical ectopic pregnancy. Figure 2. 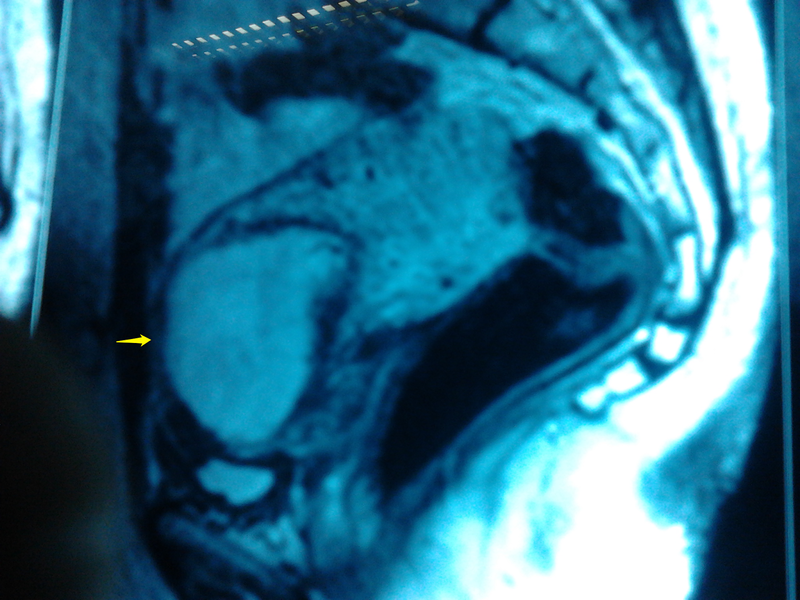 MRI image of scar ectopic pregnancy with absent myometrium between the sac and the bladder. Figure 3. Distended vascular anterior wall of the isthmus. Rotas et al defined CSEP as the one located outside the uterine cavity with myometrium and fibrous scar tissue surrounding it completely. Vial et al divided the scar implantations in two groups based on their growth either in cervico-isthmic space or into the deeper myometrium and proposed criteria for the same. Our case fits in the second category which grew into the muscle and was likely to rupture. Tsai et al proposed clubbing early lower segment aberrant implantations as ‘Low-lying-implantation ectopic pregnancy’ for ultrasound diagnosis as there was no significant difference in operation time, blood loss and success in their cohort of forty two cases. The most common presentation is painless vaginal bleeding and hemorrhage from uterine rupture can be fatal. In a review of more than seven hundred cases of CSEP Timor-Tritsch et al found that diagnosis was missed in more than 13% cases. MRI is helpful in making a diagnosis if TVS is inconclusive. Medical management has been done with local or systemic MTX therapy or Local embryocide injection like potassium chloride. With advanced gestational age and serum b HCG levels in excess of 5000 mIU/ml, systemic MTX alone is not effective and intrasac MTX or other additional therapy is required. Curettage has been found to have the highest complication rate. Jurkovic et al reported 71% success with medical management in early SCEPs. Intrasac instillation of potassium chloride or MTX had the least complication rate in the series reviewed by Timor-Tritsch et al. Hysterectomy is the last resort in cases complicated with life threatening hemorrhage. In conclusion apparent cervical ectopic pregnancy may actually be a scar ectopic implantation in cases of previous cesarean section and careful review is required to avoid scar rupture. Wu X, Xue X, Wu X, Lin R, Yuan Y, Wang Q, Xu C, He Y, Hu W. Combined laparoscopy and hysteroscopy vs. uterine curettage in the uterine artery embolization-based management of cesarean scar pregnancy: a cohort study: Int J Clin Exp Med 2014;7(9):2793-2803. Rotas MA, Haberman S, Levgur M, Cesarean scar ectopic pregnancies, etiology, diagnosis and management, Obstet Gynecol 2006;107:1373-81. Jurkovic D, Hillaby K, Woelfer B, Lawrence A, Salim R, Elson CJ. First-trimester diagnosis and management of pregnancies implanted into the lower uterine segment cesarean section scar. Ultrasound Obstet Gynecol 2003;21:220-227. Timor-Tritsch IE, Monteagudo A, Santos R, Tsymbal T, Pineda G, Arslan AA. The diagnosis, treatment, and follow-up of cesarean scar pregnancy. Am J Obstet Gynecol 2012; 207:44. e1-13. Vial Y, Petignat P, Hohlfeld P. Pregnancy in a caesarean scar. Ultrasound Obstet Gynecol 2000:16:592-3. Tsai SW, Huang KH, Ou YC, Hsu TY, Wang CB, Chang MS, Li KH, Kung FT, Low-lying-implantation ectopic pregnancy: a cluster of cesarean scar, cervico-isthmus, and cervical ectopic pregnancies in the first trimester. Taiwan J Obstet Gynecol. 2013 Dec;52(4):505-11. Timor-Tritsch IE, Monteagudo A. Unforeseen consequences of the increasing rate of cesarean deliveries: early placenta accreta and cesarean section scar pregnancy; a review. Am J Obstet Gynecol 2012;207:14-29. Wu R, Klein MA, Mahboob S, Gupta M, Katz DS. Magnetic Resonance Imaging as an Adjunct to Ultrasound in Evaluating Cesarean Scar Ectopic Pregnancy. J Clin Imag Sci 2013;3:1-5. Ash A, Smith A, Maxwell D. Caesarean scar pregnancy. BJOG 2007; 114:253–263.